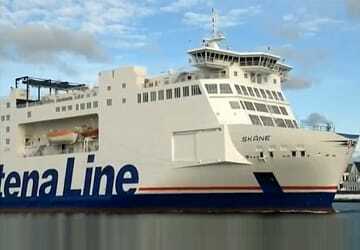 Skåne has a capacity of 600 passengers with 150 cabins for a peaceful night’s sleep and can hold up to 500 vehicles. 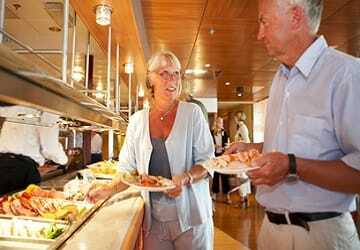 On board you will find facilities such as a children’s playroom, restaurant, bar, duty free shopping centre and more. Please Note: Whilst we have taken great care in making our Skåne guide as accurate as possible, onboard facilities, services and entertainment may vary depending on the date and time of year that you travel, facilities mentioned may change without notification and ferry companies reserve the right to operate vessels other than those mentioned at time of booking without prior notification. Nice travel, smooth and just in time, according to schedule. We traveled with a horse and we were given priority by the staff in every way. Fantastic service and wonderful ship! Would love to travel with Stena for our next sailing as well. Punctual trip. Trip was nice and the cabin (external) was clean and tidy. Breakfast had few sweet dishes similar to the italian taste. I recommend to book the first breakfast. Reccomend it. I travelled Rostock- Trelleborg with Stena Line, I can strongly recommend that ferry. Next time to Sweden will travel with the same company., the trip was very nice , you could relax and the price was very good (if you booked before). "A lot of rest and sleep"
We usually take the evening ferry when we travel south. This time we took the morning ferry. It was a nice and relaxing experience. Good breakfast, nice staff and plenty of room. Good as night ferry. Well rested when you arrive to Germany. The shop should be open longer during the day crossing. Nekem megfelelő volt minden gyors beszállás és gond nélküli megérkezés. "Ok! ; but don't forget anything on the ferry!" Good handling of ticket ordering, boarding of the ship and checking in to the cabin. The cabin was situated on the top deck, great location, clean and neat. I can recommend these cabins. However I forgot a shirt there and I haven't heard anything about it despite being promised a reply within 48 hours, which has now passed a long time ago. goodmorning, nothing to say about the services on board, all good. But the staff in the garage is very rude. "Overnight ferry Trelleborg to Rostock"
The on-board cabin provided a very comfortable night's crossing for us. However, the one thing that detracted from its comfort was the shower, which needed attention, as the water when the shower was in use was very slow to run away and in danger of spilling over into the rest of the bathroom area. Apart from that and the somewhat over-priced food, we enjoyed the crossing. Announce earliest boarding time, so that you don't have to wait in the car for hours. Our latest trip was good. Nice staff at the restaurant and the shop. Despite the crossing time of 6 hours we were never bored. It's nice not having to drive through Denmark on the way home. The boat was clean and fresh. We sat outside and enjoyed the sun when we left Rostock, then had dinner, did some shopping and relaxed with a book and watched some Swedish TV which was nice after being abroad. The only complains I have is the slots that didn't work.